William Congreve (January 24, 1670 – January 19, 1729) was an English playwright and poet. He was born at Bardsey near Leeds and attended school through his elementary years in Ireland. His works include plays, opera, and other various works of literature. Two of his most popular and well-known plays are Love for Love in 1695, and The Way of the World in 1700, for which he is most famous. Congreve came at the end of the period of Restoration literature as the population appeared to rebel against the earlier strictures of the Puritan revolution. As tastes changed again, Congreve fell silent. For the majority of his life, he lived on his reputation and the royalties from his plays. Congreve died on January 19, 1729, in a carriage accident and was buried in Westminster Abbey. A monument over the grave site was erected by the Duchess of Marlborough, with whom he was rumored to be romantically involved. His plays are still produced due to his mastery of pure comedy. William Congreve was born in Bardsey, West Yorkshire, England (near Leeds) to William Congreve (1637–1708) and his wife, Mary (née Browning; 1636?–1715). Although the inscription on his monument over his grave lists his date of birth as 1672, he was actually born and baptized in 1670. His sister, of whom, little is known, was born in 1672 shortly after his birth. His father was a Cavalier solider, had settled during the reign of Charles II, and was placed in command of the garrison at Youghal soon after William was born. Due to his father's tour of duty, William spent his childhood in Ireland, where he attended school at Kilkenny. He was then educated at Trinity College in Dublin, where he met Jonathan Swift, forming a lifelong friendship with him. Upon graduation, he moved to London where he matriculated in the Middle Temple as a student of law. However, he felt himself pulled toward literature, drama, and the fashionable life. His literary apprenticeship was served under the tutelage of John Dryden, the leading playwright of the day, from whom he learned a great deal. He originally used the pseudonym of "Cleophil" in his works, especially in a novel whose existence is now remembered only through the unabashed avowal of the austere moralist, Dr. Johnson, who waggishly claimed that he "would rather praise it than read it." 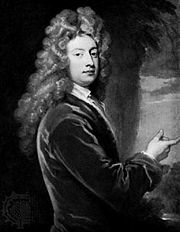 In 1693, Congreve's real career began with the brilliant appearance and instant success of his first comedy, The Old Bachelor. This success was under the generous auspices of Dryden, then as ever a living and immortal witness to the falsehood of the vulgar charges which taxes the greater among poets with jealousy or envy, the natural badge and brand of the smallest that would claim a place among their kind. The dis-crowned laureate had never, he said, seen such a first play, and was in awe of Congreve and his work. He went on to write three more plays, and lived a mundane routine in the latter part of his life, not publishing any major works. The one memorable incident of his later life was the visit of Voltaire. It is thought that Congreve astonished and repelled Voltaire with his rejection of proffered praise and the expression of his wish to be considered merely as any other gentleman of no literary fame. The great master of well-nigh every province in the empire of letters, except the only one in which his host reigned supreme, replied that in that sad case Congreve would not have received his visit. Although Congreve never married, he was famous for his friendships and romances with prominent actresses and noblewomen in his own era and through subsequent generations. One of these women included Anne Bracegirdle, for whom he wrote major parts in all his plays. He also courted Henrietta Godolphin, 2nd Duchess of Marlborough, daughter of the famous general, John Churchill, 1st Duke of Marlborough, whom he had probably met by 1703. Congreve and Henrietta had a love affair that produced his sole offspring, a daughter, Mary (1723–1764). His even course of good fortune under Whig and Tory governments alike was counterweighted by the physical infirmities of gout and failing sight. As early as 1710, he suffered both from gout and from cataracts on his eyes. Then, in late September 1728, Congreve suffered a carriage accident of an upsetting of his carriage, from which he never recovered. It is thought that from this accident, he received an internal injury, which was from a journey to Bath. He died on January 19, 1729, in consequence of that injury and his internal wounds. He was buried in Westminster Abbey, after lying in state in the Jerusalem Chamber, where a monument was erected in his honor. The patron and solicitor of the monument, Henrietta Godolphin, 2nd Duchess of Marlborough, with whom he was romantically involved during his later years. William bequeathed the bulk of his fortune to her, although there was controversy as to who received the final pay out from Congreve's fortune. That Henrietta should receive the money, rather than his family, which were reported to be going through a period of financial difficulty, upset many. Another surprise in his last will and testament was that Mrs. Bracegirdle, the actress, with whom he had lived longer on intimate terms than with any other mistress or friend, only inherited £200. Congreve's first play, The Old Bachelor (1693) was an enormous success when it was produced at the Theatre Royal, Drury Lane. John Dryden, Congreve's mentor, wrote that he had never read so brilliant a first play, and was impressed with the level of sophistication that Congreve displayed through the play. Congreve's next effort, however, was not so successful. The Double-Dealer (1693) revolved around a socialite who deceives everyone with the simple device of telling the plain truth. Although most modern critics consider The Double-Dealer an improvement over Congreve's first play, it was snubbed by critics and audiences alike. Congreve was irritated by what he perceived as the obtuseness of the public in their reaction to the play, and took a two year absence before writing a play again. In Love for Love (1695), Congreve temporarily returned to the public favor, and it still remains popular with audiences. His reputation improved still further with the production of his only tragedy, The Mourning Bride, in 1697. However, the masterpiece of Congreve was by far The Way of the World, which was released in 1700. Unfortunately, through his plays, Congreve's wit and his characters' sexual freedom and experimentation was at odds with the thinking of certain moralists of the day. In a critique by Jeremy Collier, (A Short View of the Immorality and Profaneness of the English Stage) in 1698, Congreve was directly attacked, along with his predecessor, Dryden. Collier succeeded in garnering public support for his cause by beginning with the accepted neoclassical doctrine that the purpose of drama is to teach and please and then pointing out the disparity between theory and practice. Congreve responded to Collier's accusations in Amendments of Mr. Collier's False and Imperfect Citations that same year, defending his work and his honor. However, the conservative middle class, determined to make its tastes felt, sided with Collier and the Society for the Reformation of Manners. It became increasingly difficult to get a play produced during this time, unless it conformed to Collier's doctrine. Realizing that his protests were in vain, Congreve gave up playwriting altogether, resolving to "commit his quiet and his fame no more to the caprices of an audience," when he was only thirty years of age. Although, he would write no more plays, Congreve did not retire entirely from the theater. He wrote the libretto for two operas and collaborated, in 1704, in translating Molière's Monsieur de Pourceaugnac for Lincoln's Inn Fields. However, for the next twenty-nine years, he lived mostly on his reputation and the royalties from his plays, as he withdrew from the theater, living on residuals from his early work. His output from 1700 was restricted to the occasional poem and some translations. Although The Way of the World was coolly received when it was first acted at Lincoln's Inn Fields, it has since come to be considered one of the most intellectually accomplished of English comedies. The story revolves around a pair of lovers, Millamant and Mirabell, who establish a rather unconventional marriage arrangement based on their knowledge of the way of the world which, as they know, is inhabited primarily by intriguers, fops, and fools. The main character and libertine, Mirabell, is in love with Millamant, a niece of Lady Wishfort, who pretends to make love to the aunt to conceal his suit for the niece. His trick is revealed by Mrs. Marwood, who does so to seek revenge because Mirabell has rejected her advances. Lady Wishfort, who now hates Mirabell "more than a quaker hates a parrot," will deprive her niece of the half of the inheritance she controls if Millamant marries Mirabell. Mirabell has his servant Waitwell impersonate his uncle, Sir Rowland, and pretend to marry Lady Wishfort, but only after having secretly married him off to her maid, Foible. He hopes to use this humiliating deception to force Lady Wishfort to consent to his marriage to Millamant. The plot is discovered by Mrs. Marwood, who also finds out that Mirabell has had a previous intrigue with Mrs. Fainall, daughter of Lady Wishfort, after which she married her off to Mr. Fainall, thinking that she was pregnant with his child. She conspires with Fainall, her lover, who pretends to be the friend of Mirabell, to reveal this information to Lady Wishfort, while Fainall threatens to divorce his wife and to discredit Lady Wishfort unless he is given full control of Mrs. Fainallís property and Millamant's portion is handed over to him. The scheme fails. Mrs. Fainall denies all and brings proof of Fainall's affair with Mrs. Marwood, while Mirabell produces a deed by which Mrs. Fainall, before her marriage, made him trustee of all her property. In the end, Lady Wishfort, grateful for her release from Fainall's threats, forgives Mirabell and consents to the marriage. Fainall: Your fame I have preserved. Your fortune has been bestowed as the prodigality of your love would have it, in pleasures which we both have shared. Yet, had not you been false, I had e’er this repaid it—’Tis true—had you permitted Mirabell with Millamant to have stolen their marriage, my lady had been incensed beyond all means of reconcilement: Millamant had forfeited the moiety of her fortune; which then would have descended to my wife;—And wherefore did I marry, but to make lawful prize of a rich widow’s wealth, and squander it on love and you? Mrs. Marwood: Deceit and frivolous pretense. Fainall: Death, am I not married? What’s pretense? Am I not imprisoned, fettered? Have I not a wife? Nay, a wife that was a widow, a young widow, a handsome widow; and would be again a widow, but that I have a heart of proof, and something of a constitution to bustle through the ways of wedlock and this world. Will you yet be reconciled to truth and me? Mrs. Marwood: Impossible. Truth and you are inconsistent—I hate you, and shall for ever. Mrs. Marwood: I loath the name of love after such usage; and next to the guilt with which you would asperse me, I scorn you most. Farewell. This excerpt demonstrates the essence of the world of Restoration manners, where all language of personal experience and feeling is tainted. Love, hatred, deception, and vows are all discussed between the characters, showing that the corruption of such values touches everything in their lives. Through this encounter, Congreve uses Fainall and Mrs. Marwood to reveal that the essence of this world is about, jealousy and detestation. William Congreve wrote some of the most popular English plays of the Restoration period of the late seventeenth century. By the age of thirty, he had written four comedies, including Love for Love (premiered April 30, 1695) and The Way of the World (premiered 1700), as well as one tragedy, The Mourning Bride (1697). His popularity and fame during and after his lifetime came from all of his plays, especially his masterpiece, The Way of the World, in which, he was able to demonstrate his ability to write comedy in its highest and purest form. William Congreve has been compared to some great literary writers in and after his time period. Of Congreve's immediate predecessors, William Wycherley most often mirrored many of the techniques and situations that Congreve himself implored, but was not match for his wit and candor. While Congreve cannot be equally compared to the likes of Moliere, he earned himself a place in literature due to his comedy throughout his plays. It is said that "only perhaps in a single part has Congreve half consciously touched a note of almost tragic depth and suggestion; there is something well-nigh akin to the grotesque and piteous figure of Arnolphe himself in the venerable old age of Lady Wishfort, set off and relieved as it is, with grace and art worthy of the supreme French master, against the only figure on any stage which need not shun comparison even with that of Célimène." Unfortunately, Congreve's career ended almost as soon as it began. After writing five plays from his first in 1693 until 1700, he produced no more as public tastes turned against the sort of high-brow sexual comedy of manners in which he specialized. False Though She Be, poem, date unknown. A Hue and Cry after Fair Amoret, poem, date unknown. ↑ Scott McMillin, Restoration and Eighteenth-Century Comedy (Norton Critical Editions) (New York and London: W. W. Norton & Company; 2 Sub edition, January 1997). ↑ William Congreve also participated in a number of translations after 1700, much of which are not accounted for. All links retrieved June 13, 2013. This page was last modified on 13 June 2013, at 14:36.